As part of the Faculty’s educational policy, we provide access to party wall related information, which can be found here. You can download a copy of the Party Wall etc. Act 1996 or the Government produced an Explanatory booklet and the Faculty also produces its Party Wall Explanatory leaflet to guide those who believe they may be affected by the Act. These can be found under the heading Free Publications. For the party wall surveyor or those generally that have an interest in party wall matters, we offer two popular books under the Premium Publication section called Misunderstandings and Guidance – The Party Wall etc. Act 1996 and the Third Surveyor. Note that further documents such as Case Law and Legal Opinion are available to our members, in the Members Area. The Party Wall etc. Act 1996 (Electronic Communications) Order 2016. Online and downloadable copies of the Act from legislation.gov.uk. The Party Wall etc. Act 1996. Online and downloadable copies of the Act from legislation.gov.uk. The following publications can be purchased from this site and will be delivered directly to your door. 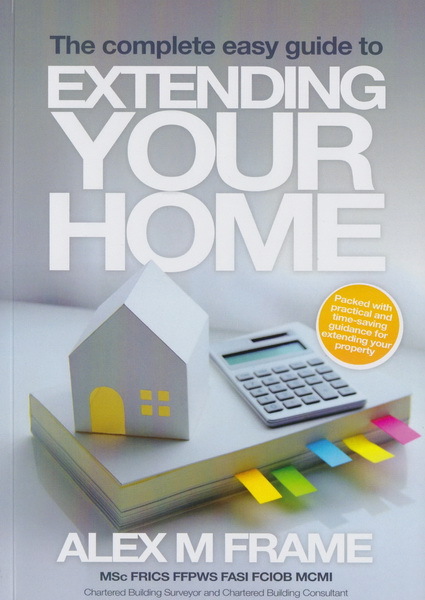 Over 200 pages packed with useful construction information starting from the planning and design, through all the stages of an extension from foundations to roof including services etc. The book is full of useful illustrations and a must for all those who are not so familiar with building construction techniques. The book costs £37 including postage and packaging. If you wish to purchase Misunderstandings & Guidance - Party Wall etc. Act 1996 and The Third Surveyor we offer a £5 discount for a total of £58. Both of these books are published by The Faculty of Party Wall Surveyors. Misunderstandings & Guidance is easy to read, factual and most importantly to the point. It is a must have for all professional libraries, both private and in the public sector along with the experienced and progressing party wall surveyor. This version published in February 2017 has been updated to form a third edition as a result of the effects of recent case laws together with further clarification of misunderstandings throughout the book. Alex Frame's book explains the process whereby one arrives correctly at the appointment of a Third Surveyor in a straightforward and comprehensible manner and then proceeds to explain in clear and concise terms the need for extensive and wide ranging abilities and knowledge necessary for a Third Surveyor to be able to provide advice, guidance and assistance to party wall surveyors, including a section at the end of the book providing an example of a Third Surveyor model award. These books can be purchased separately for £31.50 each - see below. This CPD Study Course book is particularly useful for the beginner in party wall surveying or for those who need to quickly accumulate CPD hours but is not to be seen as a replacement for attending CPD events. CPD stands for Continuing Professional Development and is aimed at expanding the knowledge of the participant, whilst satisfying their professional body’s requirements. Once you have returned the completed questions in Part 11, the Faculty will issue the CPD certificate. This CPD Study Course book will provide 7 hours of CPD. After which, if not already a full member of the Faculty, the candidate will have the added bonus of making an application for full membership into the Faculty of Party Wall Surveyors, subject to the submission of two party wall awards, followed by an interview. This book is published by the Faculty of Party Wall Surveyors. An Easy Guide, written by Alex Frame, is well explained, using simple non-technical language, with clear definitions of the terms regularly encountered when dealing with party wall matters. This is an essential guide for those wishing to undertake party wall works. It points the reader in the right direction and when to seek professional assistance. *Faculty Members wishing to purchase this guide should contact the Administration office for a discount on single and multi-buy options. Misunderstandings & Guidance, Second Edition is available for purchase and costs £31.50 including p&p. This book is easy to read, factual and most importantly to the point. It is a must have for all professional libraries, both private and in the public sector along with the experienced and progressing party wall surveyors. This version published in February 2017 has been updated to include the effects of recent case laws together with further clarification of misunderstandings throughout the book.